What makes Vladae unique? Training system and training techniques. Does a magic wand exist? Vladae says "YES"
For Vladae the right training system is like being on the right channel, while training techniques are fine tuning for you dog and your situation. Vladae's unique and unparalleled methods originated in Russia, and the results they deliver are astonishing; it is like nothing that you have ever seen. The Training System is the way you live and behave with your dog. It is developed for you so your dog can be a most compatible companion. The Training System develops a pet who RESPECTS you as well LOVES you, making your relationship more enjoyable for both of you. By putting a social distance between you and dog, your pet is happier and more eager to please and obey you. 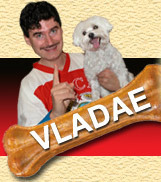 "You do what I do because I do what the dogs do"
Vladae's communicates with the dog in doglish. This is a real miracle - he really communicates to the dog in doglish. He communicates with sharp words and movements, a system of body blocks and eye movements. He uses his hands like a dogs paw and his fingers as teeth. He also teaches his clients how to determine the best way to communicate with their dog and apply it to the situations in their daily life. Training the dog from the dog's point of view and talking to the dog in the dog's language is one of the major secrets of his success. It would be hard to communicate with someone if you did not know their language, culture, system of government and societal norms. By learning these features of your dogs, you communicate with them so they know and respect how you live.